The first modern Olympic Games were held in Athens on 6th April 1896, and one of the main events was the marathon, commemorating the legendary run by Pheidippides from Marathon to Athens to announce victory in battle. 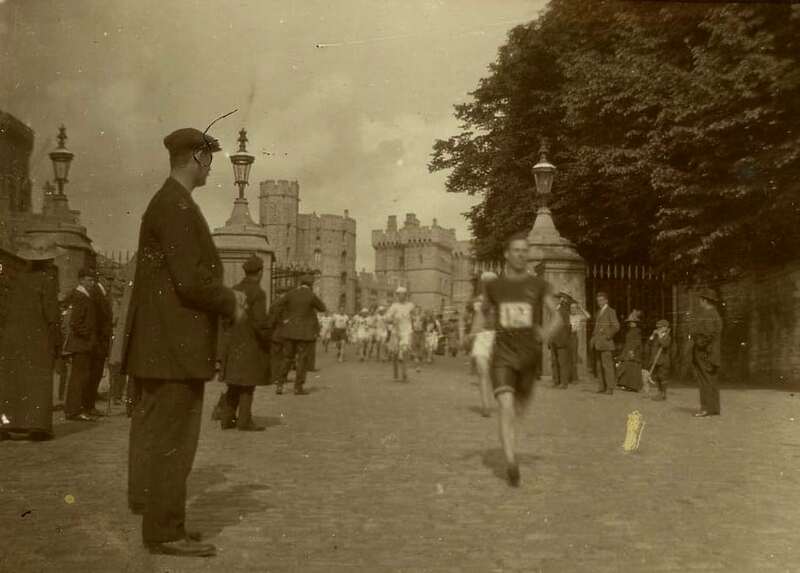 For the 1908 Olympic Games in London, the British Royal Family requested that the marathon start at Windsor Castle so that the Royal children could witness its start. As a result, the marathon distance was changed to 26 miles to cover the ground from Windsor Castle to White City Stadium, with 385 yards added on so the race could finish in front of the Royal Family’s viewing box. In 1924, this distance became the standardized length of a marathon. In the recently re-catalogued Kathleen Naylor collection are 2 photographs of the start of the 1908 Olympic Marathon from Windsor to Chiswick. Kathleen’s father, Fred Naylor, was a lay clerk at the Chapel for over 60 years from 1895 to 1957, and these photographs form part of the collection of records covering his life and those of his children at St George’s Chapel, and the many events in and around the Castle that they witnessed.